As the saying goes, “No risk, no reward.” Every organization has risks to face. And while it’s unrealistic to think we can prevent every loss, certain risks demand our attention. In employment screening, we address key human capital risks – those related to the “human factor” of the organization. Specifically, employment screening is designed to bring an objective view to the decisions made around hiring, promoting, retaining, and dismissing employees. Rather than relying on “gut feel” or what’s stated on an applicant’s resume, employment screening gives you clear methods by which to verify claims and check the background of a prospective or current employee. Screening programs can also strengthen an organization’s defense in the event of a negligent hiring or negligent retention lawsuit by demonstrating ‘duty of care’ in the employment process. The process of establishing an employment screening strategy for risk management begins with a risk assessment and ends with setting clear and consistent hiring criteria. Background screening programs are tuned to the risk appetite and tolerance level of the organization’s leaders. In other words, we take into account the amount of exposed risk an organization is willing to accept (risk appetite) and the amount of uncertainty the organization is willing to accept (risk tolerance) in relation to human capital. 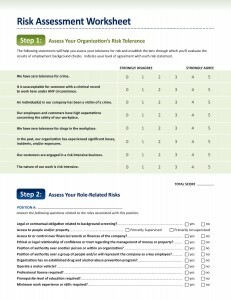 A risk assessment helps to measure and define those boundaries by looking at both the enterprise risk appetite and tolerance and the role-related risks. Download our Risk Assessment Worksheet for a quick and easy approach. And remember, no risk assessment is complete without a comprehensive assessment of the organization’s compliance requirements. In certain situations, your organization may have a legal or contractual obligation that supersedes all else. Alright, so you’ve got a background screening report in your hands. The next obvious step in your risk management strategy is to define how you’ll judge the results of the background check to make employment-related decisions. There is much to consider, including FCRA, Title VII, and other state and federal laws. Importantly, your decision criteria should be consistent across all applicants or candidates for a given position, brightline policies around criminal reports or credit checks should be approached with extreme caution, and your program should include a targeted screen and an individualized assessment component. In the end, there is much to be gained by approaching employment screening from a risk management perspective rather than a mere “check the box” activity. Our latest background screening guide offers much more on these topics. Download the Employment Screening Survival Kit here.